LEXINGTON, Ky. (AP) — As No. 10 Kentucky works through initial growing pains, it can feel good about its first lopsided win this season. PJ Washington set a career high with 25 points and grabbed a season-best seven rebounds, Tyler Herro added 18 points and the Wildcats rolled over North Dakota 96-58 on Wednesday night. The Wildcats (2-1) finally got the dominant effort they sought after a rough first week in which Duke beat them by 34 points before they scraped by Southern Illinois. 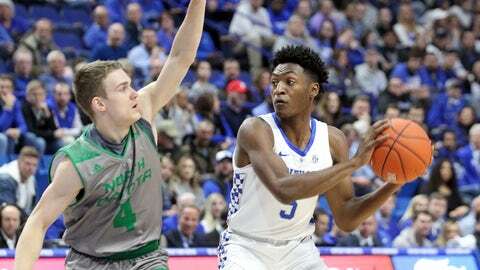 They had to shake off an initial back-and-forth with the Fighting Hawks (2-1), who led 13-12 before Washington’s 3-pointer put Kentucky ahead to stay. The Wildcats outscored North Dakota 27-7 over 9:46 for a 39-20 cushion and led by 38 in the closing minutes. That initial basket was big for Washington, Kentucky’s top returning scorer who managed just 11 points through two games. He went on to post a season-high 10 points by halftime before scoring 15 more after the break. He finished 9 of 13 from the field, including a career-best 4 of 5 from behind the arc to surpass his previous best of 22 points against Mississippi State in January. Herro was just as relieved to regroup from a scoreless performance against SIU. He went 7 of 12 with a 3-pointer to top his 14-point debut against Duke, and Kentucky shot 53 percent in the opening game of the Ohio Valley Hardwood Showcase. The Wildcats scored 31 points off 20 turnovers with 12 steals, including a career-high five by Herro. Keldon Johnson had 12 points and 10 rebounds for Kentucky’s first double-double this season. Immanuel Quickley also scored 10 for the Wildcats. Conner Avants had 14 points and Filip Rebraca 13 for North Dakota (2-1), which shot 40 percent in its first meeting with the Wildcats. Kentucky’s convincing performance, perhaps overdue, should help seal another week in the top 10 — provided the Wildcats take care of VMI this weekend. North Dakota: Perimeter shooting helped the Fighting Hawks make things interesting early against the Wildcats. That strong start lasted just six minutes as they were thoroughly overwhelmed in their first meeting against a Southeastern Conference school. They finished 7 of 19 from 3-point range but their rebounding total was four fewer than Kentucky grabbed alone offensively. Kentucky: The Wildcats looked much better than in Friday’s shaky escape against Southern Illinois. Besides shooting a season best from the field, they controlled the paint (46-18) and owned the glass 45-15. Though they were far from perfect, coach John Calipari was happy to see his team disrupt an opponent for a change. North Dakota hosts Minnesota Morris on Saturday in the first of consecutive home games. Kentucky hosts VMI on Sunday in the second game of the Hardwood Showcase, which also features Winthrop and Tennessee State.